I don’t know if there’s a Jeon Do-Yeon fan club in the US, but I’d be happy to start one. The actress, who gave the performance of a lifetime in 2007’s Secret Sunshine, is poised to be one of the truly great actors of our time. Her lack of vanity or ego in the beauty-obsessed Korean film industry is refreshing, and Jeon, along with fellow Korean star, Bae Doo-na, who also possesses the same cinematic selflessness, are two of my favourites of recent years. It makes me sad then that a film like The Housemaid (- a remake of a 1960 Korean classic by director Kim Ki-young), which could possibly be her widest American release, isn’t going to do much for her. Jeon is Eun-yi, a simple girl hired by a wealthy family as their new nanny. There is an adorable, preternaturally sophisticated little girl to look after and twins shortly on the way. The family has everything anyone could ask for; stunning home, all the perks and amenities money can buy, but it’s never enough. The lord of the manor spies Eun-yi’s shapely gams as she busily cleans their bathtub and decides he needs a new toy to play with to distract him from his wife’s gigantic pregnancy and resulting bad humour. Eun-yi gives in without any particular hesitation and the two walk an Upstairs/Downstairs tightrope. She fulfills her duties around the house, including the hand-washing of Madame’s knickers, while appearing to be no more to the husband than another household appliance until everyone’s asleep. Mrs. Cho, the long-suffering senior housekeeper, sees all and after decades of obligation and service to this family, feels the need to inform them of some changes she notices in Eun-yi. All that money and nobody can afford a condom. Eun-yi’s pregnancy turns the household upside down, with the “ladies” of the house plotting Eun-yi’s future and understanding that there’s no amount of money that will make Eun-yi eliminate her baby for their convenience. Mrs. Cho watches harm come to her underling, but still sides with them even as the family marshals all its wealth and connections against the simple young woman. The Housemaid is at its core a story of class warfare; how the rich can do anything and the poor just have to take it. This would be fine and good if it weren’t for the added component of Eun-yi’s apparent slowness. It’s never made clear if she is impaired in some way or just naïve, but her actions, particularly post-pregnancy, are often too hard to swallow. Her inability to see what’s in front of her, to protect herself and her baby is beyond frustrating; it’s a plot device and not a good one. Here’s where Jeon Do-yeon’s talent comes into play because she doesn’t make Eun-yi’s mental state a throwaway judgment: Jeon plays her as possibly slow, but also with an off-hand charm and straightforward seductiveness. Does this give us an answer? No, but it gives the character more depth than she might have had and makes her more interesting. 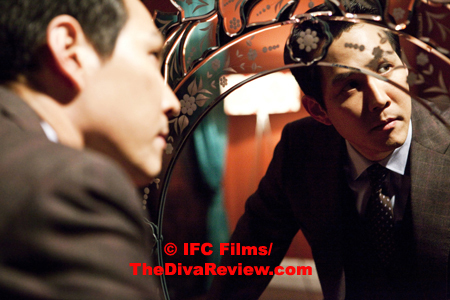 Unfortunately, the glaring problems of Eun-yi’s actions are still there, nearly obscuring the main gist of the film. The cast is excellent, leading of course with Jeon, who should be hooked up to a generator as a power source for all the real warmth she brings to the screen. Especially touching are her scenes with the aloof little daughter (- a great performance by the haunted-eyed Ahn Seo-hyeon), who clings to cheerful, loving Eun-yi in her loneliness. 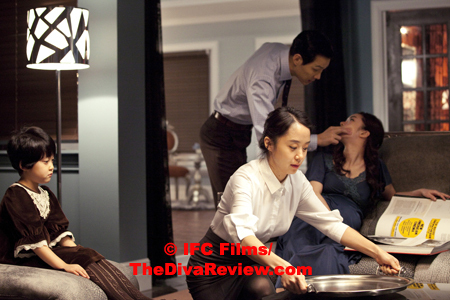 Jeon’s dominance in the film is undercut by Yoon Yeo-jeong’s powerful turn as Mrs. Cho, whose contempt for the family she’s served for so long is inexorably intertwined with her sense of duty to them. The slow creeping out of the humanity she’s hidden behind starched uniforms is brought about by Eun-yi’s sunny disposition, youth and vulnerability, exposing years of painful regret and resentfulness. Seo Woo as the hugely pregnant, spoiled wife and Park Ji-young as her cruelly calculating mother are truly a gruesome twosome, more appalled by the husband’s low-class choice of mistress than by his cheating. My other issue was the terribly missed opportunities with cinematography. Mostly set inside the family’s mausoleum-cold estate, filled with only the best of everything there is to have; how wonderful it would have been to set up the entire film with the wide angles we are occasionally shown that reveal the cavernousness of the family’s life; the magazine-slick remote luxury they dwell in, each in their own lonely worlds. Instead -- and far too frequently -- director Im Sang-soo opts for utterly unnecessary handheld camera shots, moving around when the characters are not, attempting to give a pointless documentary feel when the gothicness of a broad, steady scene would have always sufficed. 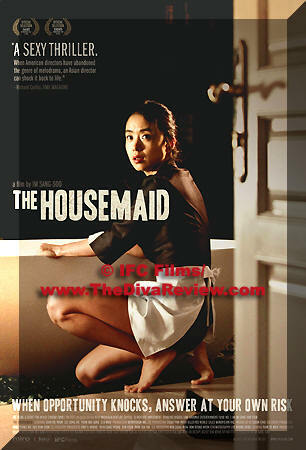 The Housemaid is mostly enjoyable, soapy, melodramatic schlock that is buoyed up by its great cast. The meditations on the disparities of class are worthy and often chilling, but our subject and her issues read more as a plot contrivance than an organic part of the narrative and get in the viewers’ way.